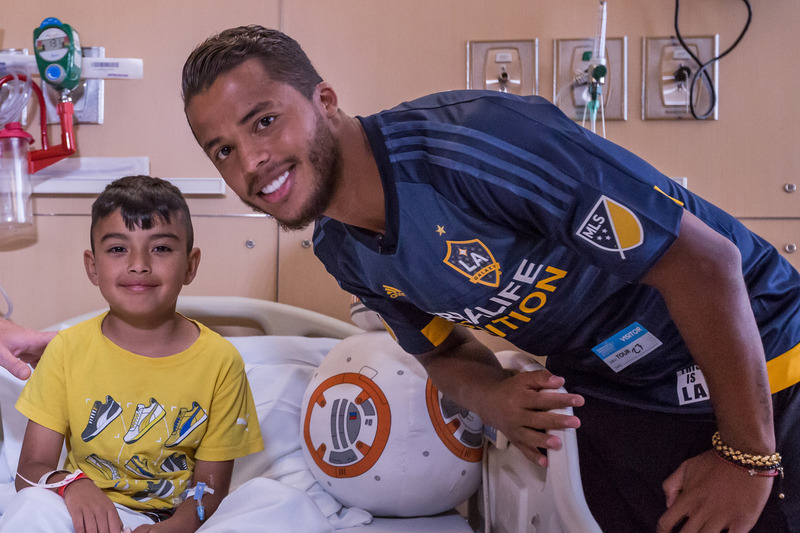 LA Galaxy forward Giovani dos Santos visits a patient at Children's Hospital Los Angeles during a team visit in 2016. Photo courtesy of Robert Mora. To kick off this new commitment to CHLA, LA Galaxy forward Giovani dos Santos partnered with Omaze to help raise funds for the LA Galaxy Foundation’s support of CHLA. One fan who donates to support the campaign will be randomly selected to win a day with Dos Santos at the Terranea Resort. The winner and a guest will also be flown to Los Angeles to stay at Terranea Resort from Aug. 11-14 and receive field-side seats to the LA Galaxy’s match vs. New York City FC on Saturday, Aug. 12 to see Giovani dos Santos in action. To enter, fans can visit www.omaze.com/gds. The LA Galaxy also honored CHLA as the official Community Partner of the Match on Saturday, April 28 during the contest against the Philadelphia Union at StubHub Center (7:30 p.m. PT; Spectrum SportsNet/Spectrum Deportes). Fans had the opportunity to meet Jelle Van Damme and Romain Alessandrini following the match at StubHub Center by purchasing an autographed mystery mini-soccer ball at the Foundation Booth in SoccerFest with all proceeds benefiting CHLA. Children's Hospital Los Angeles has been named the best children’s hospital in California and among the top 10 in the nation for clinical excellence with its selection to the prestigious U.S. News & World Report Honor Roll. Children’s Hospital is home to The Saban Research Institute, one of the largest and most productive pediatric research facilities in the United States. Children’s Hospital is also one of America's premier teaching hospitals through its affiliation with the Keck School of Medicine of the University of Southern California since 1932. For more information, visit CHLA.org. Follow us on Twitter, Facebook, YouTube, LinkedIn and Instagram, or visit the institution’s child health blog (www.WeTreatKidsBetter.org) or its research blog (www.ResearCHLABlog.org).